Muslim and Western publics continue to see relations between them as generally bad, with both sides holding negative stereotypes of the other. Many in the West see Muslims as fanatical and violent, while few say Muslims are tolerant or respectful of women. Meanwhile, Muslims in the Middle East and Asia generally see Westerners as selfish, immoral and greedy – as well as violent and fanatical. However, the latest Pew Global Attitudes survey finds somewhat of a thaw in the U.S. and Europe compared with five years ago. A greater percentage of Western publics now see relations between themselves and Muslims as generally good compared with 2006. In contrast, Muslims in predominantly Muslim nations are as inclined to say relations are generally bad as they were five years ago. And, as in the past, Muslims express more unfavorable opinions about Christians than Americans or Europeans express about Muslims. For the most part, Muslims and Westerners finger point about the causes of problems in their relations, and about which side holds the high ground on key issues. Muslims in the Middle East and elsewhere who say relations with the West are bad overwhelmingly blame the West. However, while Americans and Europeans tend to blame Muslims for bad relations, significant numbers believe Westerners are responsible. One note of agreement between Westerners and Muslims is that both believe Muslim nations should be more economically prosperous than they are today. But they gauge the problem quite differently. Muslim publics have an aggrieved view of the West – they blame Western policies for their own lack of prosperity. Across the Muslim publics surveyed, a median of 53% say U.S. and Western policies are one of the top two reasons why Muslim nations are not wealthier. In contrast, few Americans or Western Europeans think the economic challenges facing Muslim countries are a result of Western policies. And although Westerners have become less likely over the last five years to say Islamic fundamentalism is a chief cause of economic problems in Muslim nations, they remain much more likely than Muslims to hold this view. Still, even on this issue there is some consensus. 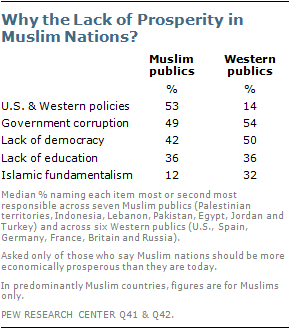 Both Muslims and Westerners believe corrupt governments and inadequate education in Muslim nations are at least partly responsible for the lack of prosperity. And perhaps reflecting the Arab Spring, in several Muslim and Western nations, people are more likely than they were five years ago to say the dearth of prosperity stems from a lack of democracy. These are among the key findings from a survey by the Pew Research Center’s Global Attitudes Project, conducted March 21 to May 15.1 The survey updates a number of trend questions from a 2006 Pew Global Attitudes poll that explored how Muslim and Western publics view one another. The current survey finds that five years later – and nearly 10 years after the attacks of September 11, 2001 – tensions remain high, although there are also some shared concerns. For instance, both Muslims and Westerners are concerned about Islamic extremism. More than two-thirds in Russia, Germany, Britain, the U.S. and France are worried about Islamic extremists in their country. Fully 77% of Israelis also hold this view. But extremism is considered a threat in predominantly Muslim nations as well. More than seven-in-ten Palestinian and Lebanese Muslims are worried about Islamic extremists in their countries, as are most Muslims in Egypt, Pakistan, and Turkey. For Muslims, the most common concern about extremism is that it is violent, although in both Egypt and the Palestinian territories the top fear is that extremism could divide the country. In four of the six largely Christian nations included in the study, most say they have a positive opinion of Muslims. The exceptions are Germany (45% favorable) and Spain (37%), although views toward Muslims have improved in both countries since 2006. Also, solid majorities in Western countries have a favorable opinion of Jews. In Spain, 59% now hold this view, up 14 percentage points from 2006. Muslim views toward Christians vary considerably across countries. In Lebanon, which has a large Christian population, nearly all Muslims (96%) express a positive view of Christians. Narrow majorities of Jordanian (57%) and Indonesian (52%) Muslims also give Christians a favorable rating, while in Egypt – which has recently experienced violence between elements of its Muslim and Christian communities – views are divided (48% favorable; 47% unfavorable). Meanwhile, very few Muslims in Pakistan (16%) or Turkey (6%) have a positive opinion of Christians. Ratings for Jews are uniformly low in the predominantly Muslim nations surveyed – in all seven of these nations, less than 10% have a positive opinion of Jews. Indeed, outside of Indonesia, less than 5% offer a positive opinion. Among Israel’s minority Muslim community, however, views are divided: 48% express a positive opinion of Jews, while 49% offer a negative opinion. In contrast, only 9% of Israeli Jews have a positive view of Muslims. Christians receive somewhat higher ratings among Israeli Muslims (67% favorable) than among Israeli Jews (51%). Muslims associate a number of negative traits with Westerners. Across the Muslim publics surveyed, the median percentages saying people in Western countries such as the U.S. and Europe are selfish, violent, greedy, immoral, arrogant and fanatical exceed 50%. By contrast, the median percentages of those who say that Westerners are respectful of women, honest, tolerant or generous range below 50%. Since 2006, Indonesian Muslims have become more likely to associate positive traits with Westerners, but in Pakistan attitudes have moved in the opposite direction – the percentage of Pakistani Muslims saying that Westerners are greedy, immoral, selfish and fanatical has increased by double-digits over the last five years. Non-Muslims in Western Europe, the U.S. and Russia offer somewhat more positive assessments of Muslims than Muslims do of Westerners. Relatively few, for example, say Muslims are greedy or immoral. However, a median of 58% label Muslims as fanatical and a median of 50% believe Muslims are violent. And few think Muslims are respectful of women. Across the nations surveyed, Christians and Muslims differ in the degree to which religion defines their identity. Among most of the Muslim publics polled, Muslims tend to identify with their religion, rather than their nationality. This is particularly true in Pakistan, where 94% think of themselves primarily as Muslim instead of Pakistani. Lebanon and the Palestinian territories are exceptions to this pattern, however – more Muslims in both countries identify first with their nationality rather than with their religion. And many Muslims refuse to choose between nation and religion, volunteering that they identify with both. Throughout Europe, most Christians think of themselves primarily in terms of their national identity. Fully 90% of French Christians take this view. The clear exception is the U.S., where Christians are divided: 46% primarily identify as American and 46% as Christian. Seven-in-ten white evangelical Christians in the U.S. identify first with their religion. Both of the major religious communities in Israel identify primarily with their religion. Nearly six-in-ten (57%) Jews identify first as Jews, while among the country’s Muslim community 77% think of themselves first as Muslims. Nearly a decade after September 11, 2001, skepticism about the events of that day persists among Muslim publics. 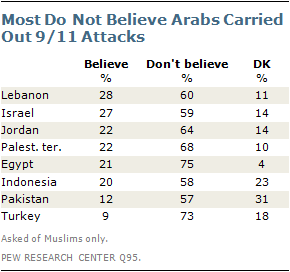 When asked whether they think groups of Arabs carried out the 9/11 attacks on the U.S., most Muslims in the nations surveyed say they do not believe this. There is a widespread perception that Muslims living in the West do not want to assimilate. Majorities in Europe and the U.S. think Muslims wish to remain distinct from the rest of society, instead of embracing the way of life in Western nations. More than two-thirds in Germany and Spain believe Muslims do not want to adopt national customs. 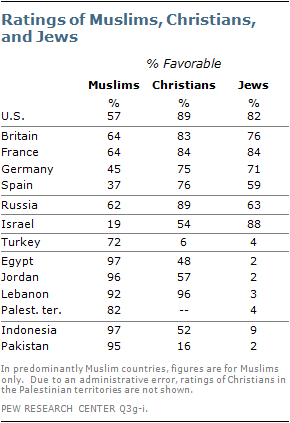 Among Muslim publics, many believe that Americans and Europeans are hostile toward Muslims. In fact, in Turkey, Pakistan, Egypt, and Jordan, the belief that Americans and Europeans are hostile has become more common since 2006. In Western nations, those who believe some religions are more prone to violence than others tend to say Islam is the most violent faith (when asked to choose among Islam, Christianity, Judaism and Hinduism). Muslim publics who think some religions are especially prone to violence tend to name Judaism. Concerns about Islamic extremism have declined significantly in Jordan over the last five years. Currently, 47% of Jordanian Muslims are worried about extremism, down from 69% in a spring 2006 poll conducted just months after the November 2005 bombing of three Amman hotels. Lebanese Muslims are consistently the least likely to assign negative characteristics to Westerners – less than half think Westerners are selfish, violent, greedy, immoral, arrogant, or fanatical. There is an education gap on views about Muslim assimilation – in Western Europe and the U.S., those who do not have a college degree are more likely than those who do to believe that Muslims want to remain distinct from the broader society.